Can You Reheat Casserole? | Can You Reheat? Q. Can you reheat casserole? I’ve asked a few people and the answers seem to differ. Give me a definitive answer, please! Can I reheat casserole? A. You can absolutely reheat casserole and make it taste incredible. There are multiple methods and several ways, and we can absolutely help you. Let’s start reheating casserole! The first and perhaps the simplest method for reheating casserole would be using a microwave. Microwaves are fast and efficient, as well as improving seemingly every year technologically. The days in which microwaves dried everything out and there was nothing that could be done about it are long gone. With a little effort and proper technique, microwaved dishes can come out juicy and delicious. One issue that could come with the microwave is simply the size of it. Most people don’t have a microwave that could hold an entire casserole dish, however, some absolutely do! (Lucky tikes!) This means you’ll need to cut the casserole into whatever size will fit and whatever size it is that you’re trying to eat. In order to prevent your microwave preparation from drying out your casserole, the right conditions need to be in place. You must store your casserole properly, tightening and containing the juices properly. I.E. use your cellophane properly! Lid your dish if possible! Covering your dish with a damp paper towel or hand towel can be the ultimate savior of moisture as well. Make sure to have your casserole distributed evenly. If you pile it, you’ll often have a cool center to it, as the heat is unable to distribute itself in an even manner. Also, make sure to keep an eye on it. There’s nothing wrong with using a lesser time, finding it to be too cool, and adding more time. This is far superior to putting it in for too long and destroying your delicious dish. The Oven Method might just be the most efficient methodology for reheating a casserole. 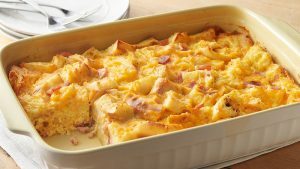 It’s typically convenient because most casseroles are stored in the same dishes in which they were originally cooked, and those same dishes are perfect for the reheating process. The only drawback would really be that if you wanted to make a smaller portion of the remaining casserole, the convenience of the method would be all but eliminated. A great tip for using an oven to reheat is to understand your temperature controls and where you should set your dial to. If you’ve ever baked anything or cooked much in the oven, you’ll have noticed that virtually everything cooked is three-hundred and fifty degrees or higher. So what temperature would be ideal for reheating something? You guessed it! Three-hundred and fifty degrees would be great! If you want to be creative, dropping down to two-hundred and fifty or three-hundred, that would be perfectly fine and, in some cases, could be the better option. The most important thing is to not cross that three-hundred- and fifty-degree threshold, lest you risk burning your delicious dish. Twenty to thirty minutes of cook-time should work for most situations, but it’s not a bad idea to check the dish at ten to fifteen minutes as well, depending on how much is in the dish being cooked. A great way in which you can help to prevent losing moisture during the reheating process is to cover the dish with either its lid or aluminum foil for the last five to ten minutes of the cooking process. You can never be too safe in the fight against food dryness. Another great method for reheating casserole is to use a skillet or a pan on the stovetop. This is a great method because you can make however much you need to reheat, just as you can with microwave. Also, it’s quick, as well as somewhat difficult to mess up, as you’ll be a constant part of the process. Take out your skillet (or pan), preferably one which you have a lid for, and add a small amount of water to it. You shouldn’t overdo it with the water, and a small layer of maybe a millimeter to a centimeter on the bottom of the pan is plenty. Then heat the pan over medium heat until it begins to boil, showing you the pan has reached its heat. Then place however much casserole you are trying to reheat on the pan. You can move it around if you choose, or just go ahead and place the lid over the top. The lid combined with the water will do a great job of cooking, as well as re-introducing and containing moisture. If your heat is high, or if the water is allowed to completely leave the bottom of the pan through evaporation, you can be at risk of burning the bottom of the casserole (which can be delicious!). To avoid that, you can always reintroduce more water to the pan during the process, or lower your heat. It’s very simple to fix and monitor any potential cooling issues during the process, which is one of the things that makes this methodology so great and a personal favorite. Don’t Let That Delicious Casserole Go to Waste! There are multiple great ways to reheat casserole! This means there are no excuses for allowing that delicious previous meal to go to waste. This includes people saying “I don’t want to eat leftovers.” They simply don’t know what they’re talking about and the only times they’ve probably eaten leftovers, they have been reheated improperly. You can use a microwave as long as you do your due diligence in making sure you retain the proper moisture levels. You can use an oven as long as you don’t turn the heat up to a ridiculous amount that will run the risk of making the casserole hardened. You can even use a skillet or a pan and reheat the dish on your stove top as long as you don’t use too much heat and work to keep your moisture. Can you reheat casserole? Yes! There’s zero good reason to let your casserole go to waste! Let’s reheat casserole!